Community Gardens (residential and public ) are popping up all over the country, I remember when I attended a Communities In Bloom Symposium a couple years back, I watched with great interest as presenters discussed the benefits on having community gardens in their towns or cities. Of course one of the benefits is obvious, the gardens yield food, but they also bring a community and family together, it is an opportunity to spend time at a project with friends and family. The opportunity to grow your own food is part of our culture, for me, I remember the gardens around my house as a child, I also remember harvesting potatoes with my grandfather (among other vegetables). It was a way of life, a necessary way of life, today it seems to be part of a lifestyle, to get back to nature and discover the satisfaction of growing your own, healthy produce. 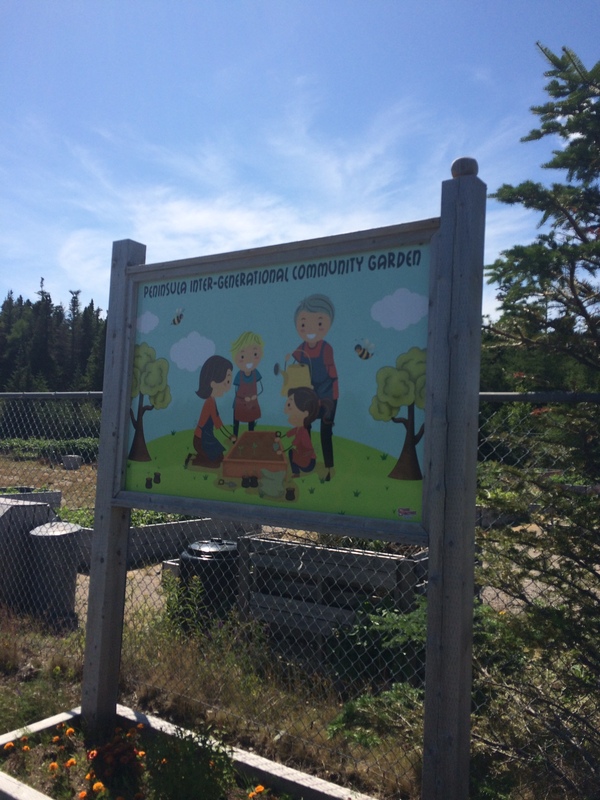 There are many places in Newfoundland and Labrador who have created Community Gardens, just down the highway from me is the beautiful community of Carbonear, they have repurposed a piece of land that was just an empty lot, but with a determined and passionate group of participants they are realizing there “fruits” (and vegetables) of their labours. 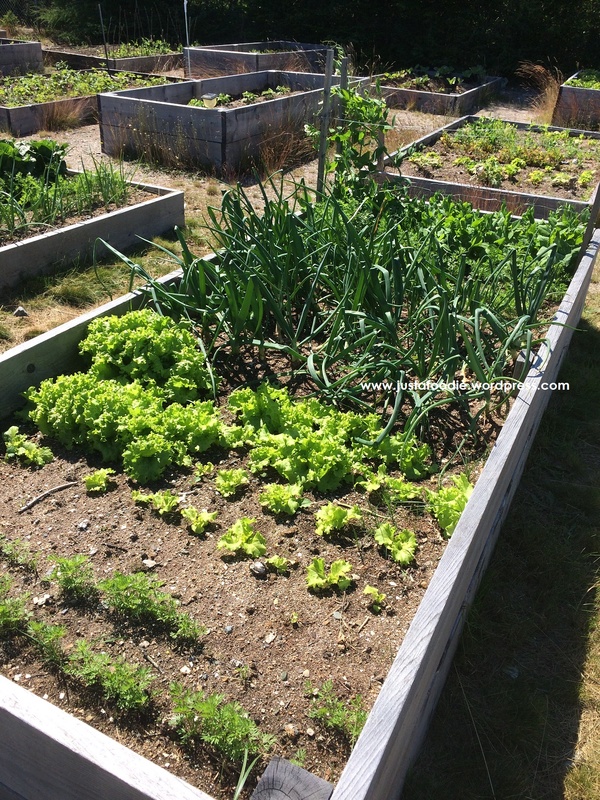 While on vacation this past summer my family and I discovered a community garden in Eastport, I took the time to stop and take as few pictures and note how the garden operated. I liked the theme and name of the garden, it was multi-generational, a place for all to grow and learn together. I love this sign, it is the true meaning of a community garden, for everyone. There was a assortment of small vegetable gardens. 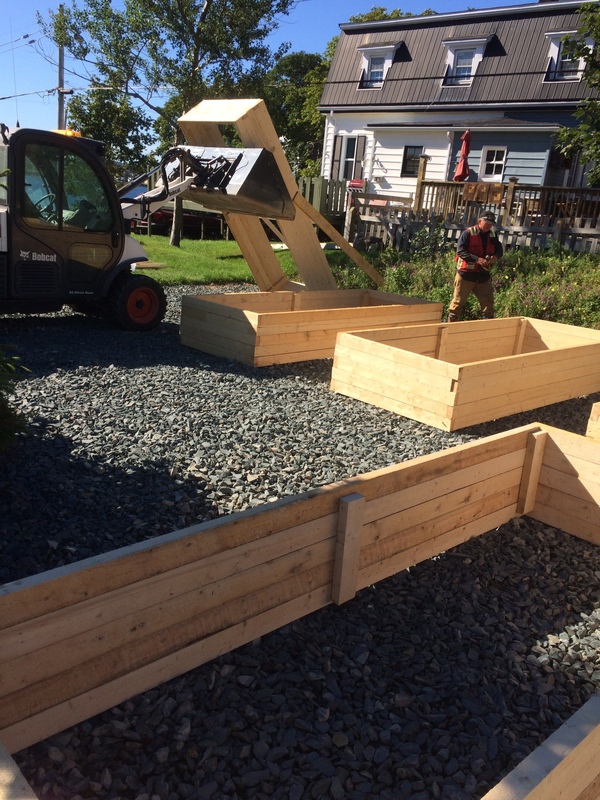 These two communities, as well as those at the Communities in Bloom Symposium serve as an inspiration to the Bay Roberts Community Vegetable Garden that we are constructing this fall. The town of Bay Roberts Council approved usage of a piece of land behind the Cable Building, a National Historic Site to begin our garden. It is still a work in progress but construction is well underway for our grand opening June 2016. There will be 25-26 vegetable gardens available for a yearly lease, garden requests will be on a first come first served basis by downloading an application on line in the coming weeks. Placing our garden boxes, the garden becomes reality! 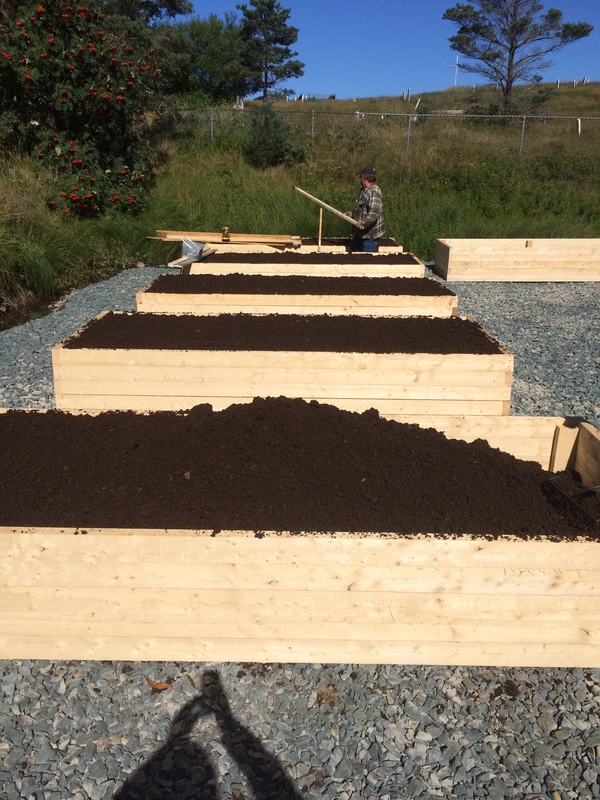 Rich Soil is added to the boxes, I can’t wait for next year!!! Work areas and a small green house will be added next spring. I will keep everyone updated with the progress of the garden as well as when the applications will be available. Personally, I am looking forward to this project as I certainly would love to have a garden to work on with my family. It is my hope that other residents of Bay Roberts support and get involved in this initiative. Funding for this project was provided by a grant to the Bay Roberts Communities in Bloom Committee from the Town of Bay Roberts.